So, it turns out cheese is not for me. 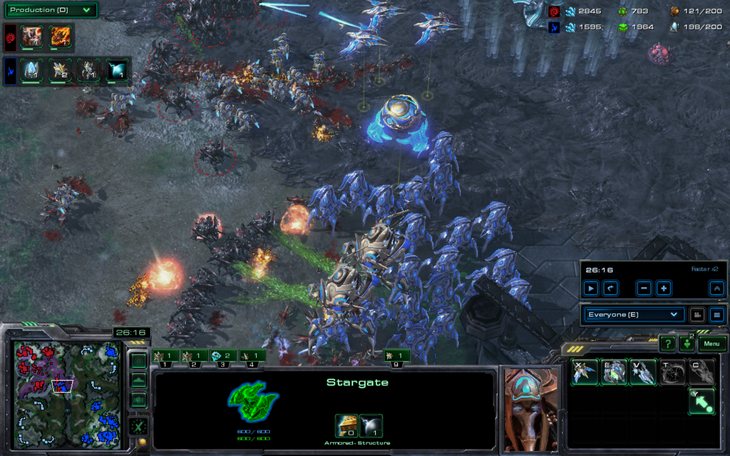 I attempted to go proxy BC against Undead1993 about a month ago and against other players, along with several other related cheese such as 2 base marine train, which is an all-in centered around 1/1 marines with stim and combat shields, 4-gate, and at least one 6-pool. They had varying degrees of success but the game just isn't as enjoyable when I try to go for that early knockout. 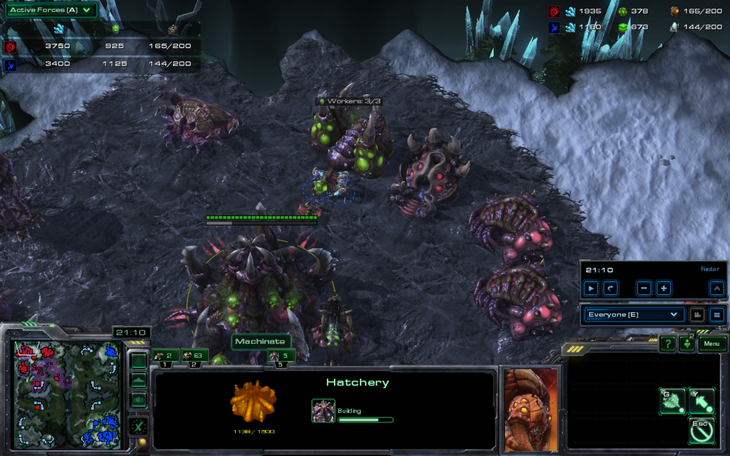 My favorite games are generally of extreme macro or amazing strategies, so why would I, an insignificant silver league player, improve in the same way a high level player would improve himself, by fixing my early game, when I'm just playing for fun? Since I'm in silver, facing silvers, who usually get silver medals against me in my battle reports and represent a sliver of all silver players, I should just play however I feel. 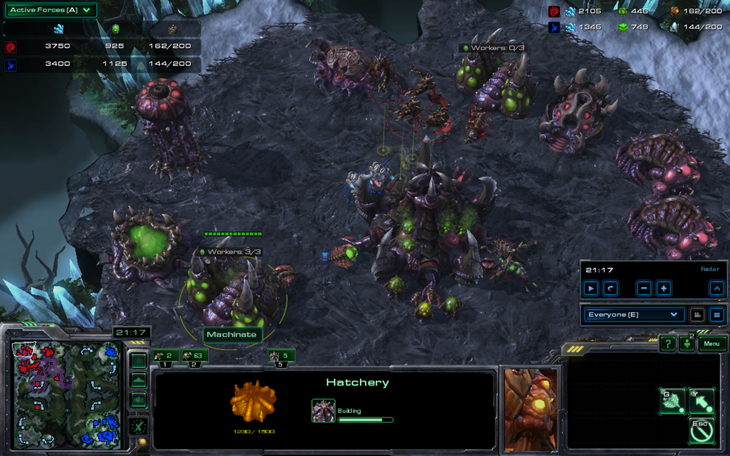 I feel like a macro game. 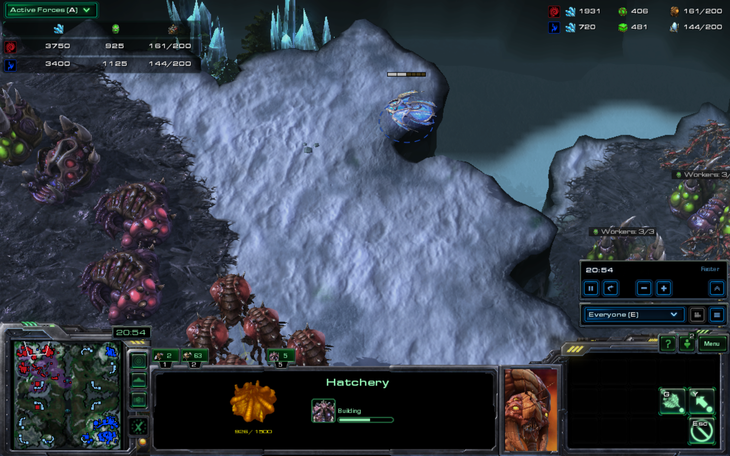 I boot up SC2, click on matchmaking, 1v1, and hover over the protoss button for a few seconds before selecting random. Why not? 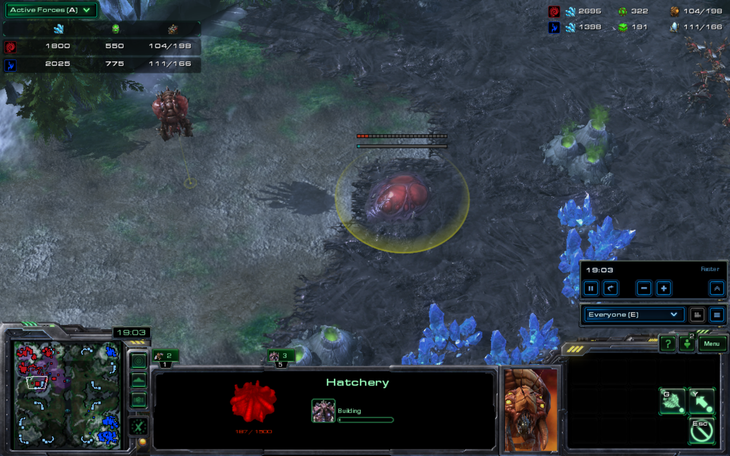 It takes little time for the matchmaking system to pair me against a zerg player. 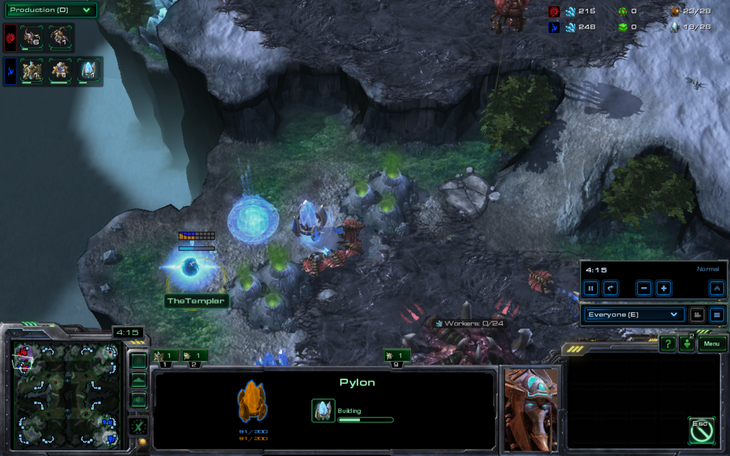 Oh well, at least it's not a terran- my TvT, ZvT, and PvT are usually very bland games. 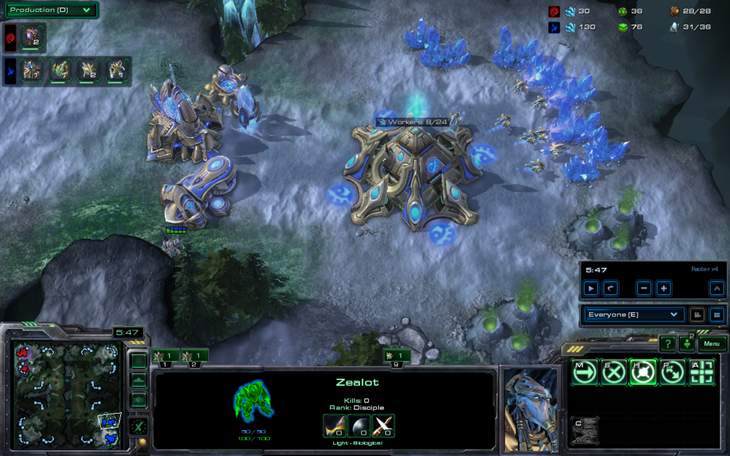 The map is frost, a large map that suits my macro style very well. 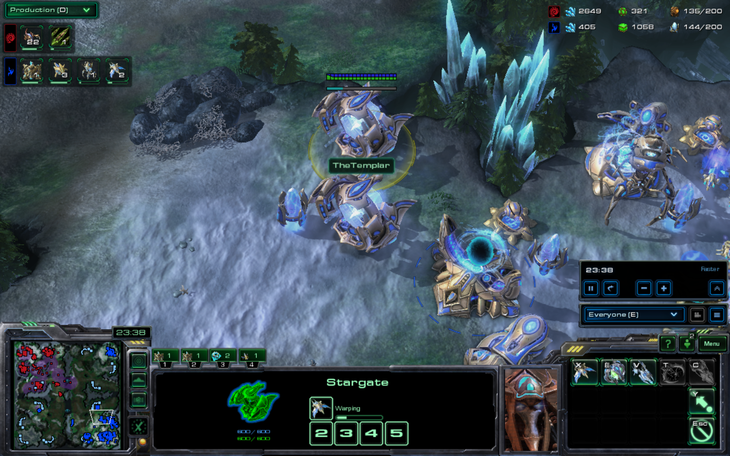 This is the first game of the day, so my build order is very strange- FFE with a gateway before nexus. Quick! Distract the drone with LASERS! 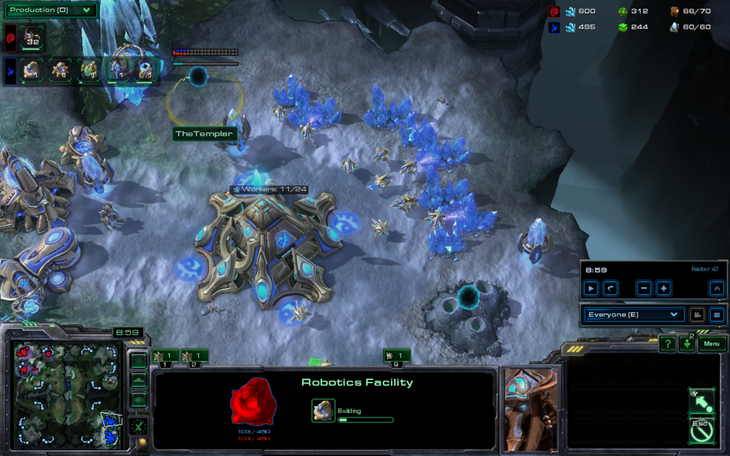 I only got one drone, but my expansion is up and running by the time he clears everything out. He wastes no time in taking a third base. 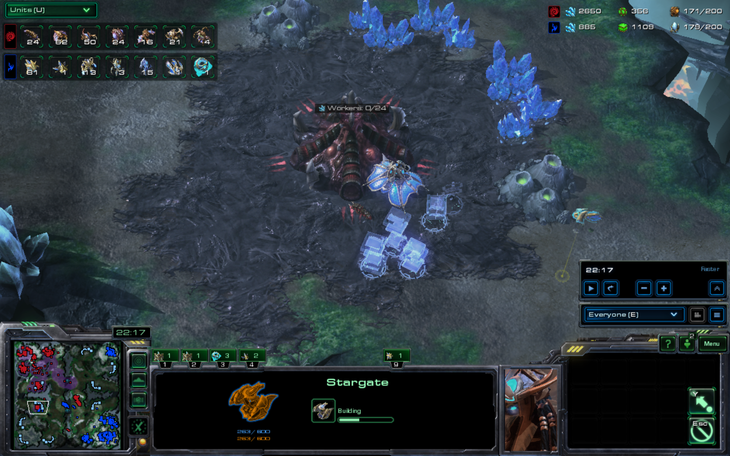 A good idea, because he's 23 drones to 30 probes. 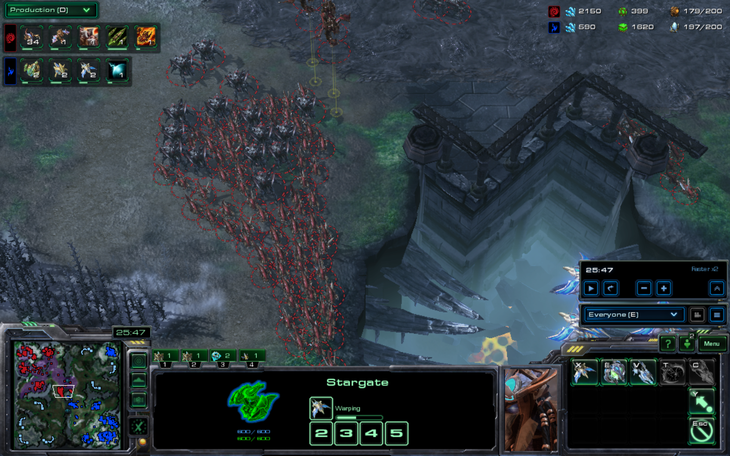 Don't even ask me what this is- some two gate push with +1 zealots and without warpgate. 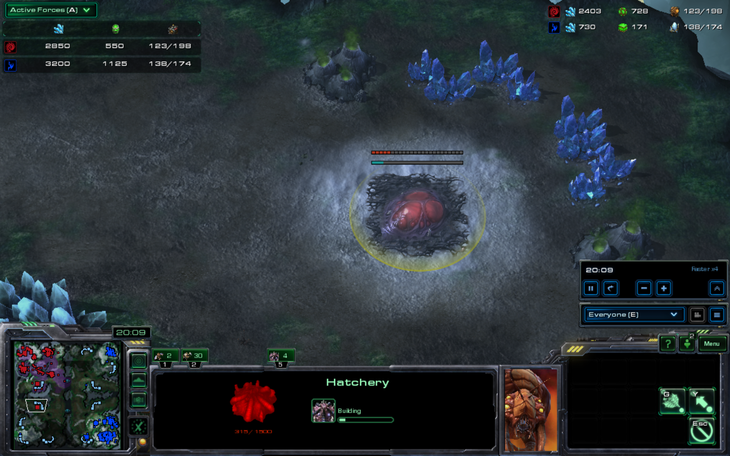 Such skill in even making a sentry for defense. Actually, that was a misclick. 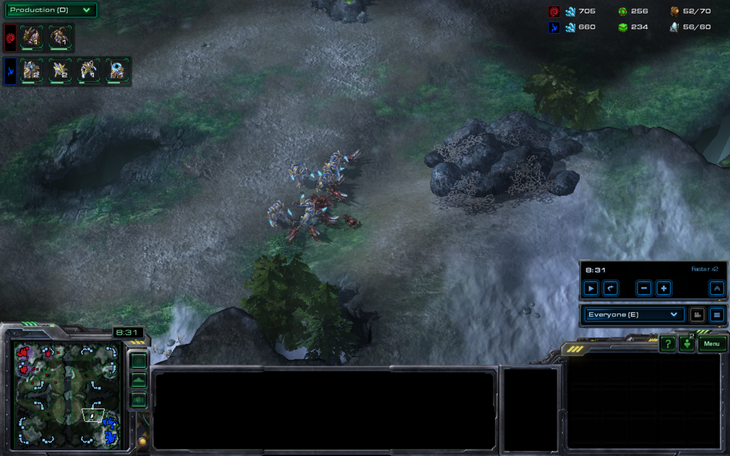 My push is good, clearing 8 randomly patrolling zerglings, and I prepare to tech to robotics facility. 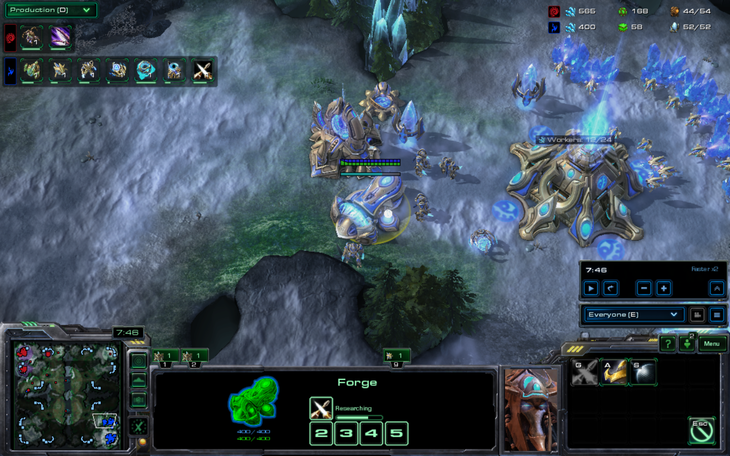 Suddenly I realize he has built units in response to my zealot pressure. How dare he!!! Oh look, roaches! And lair! I never saw this coming. 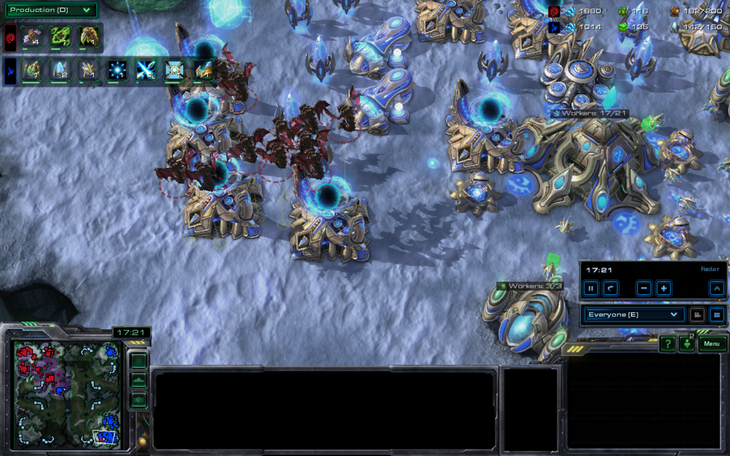 Welcome to every ZvP my opponents ever play. He decides to go for the attack so I get three total forges. 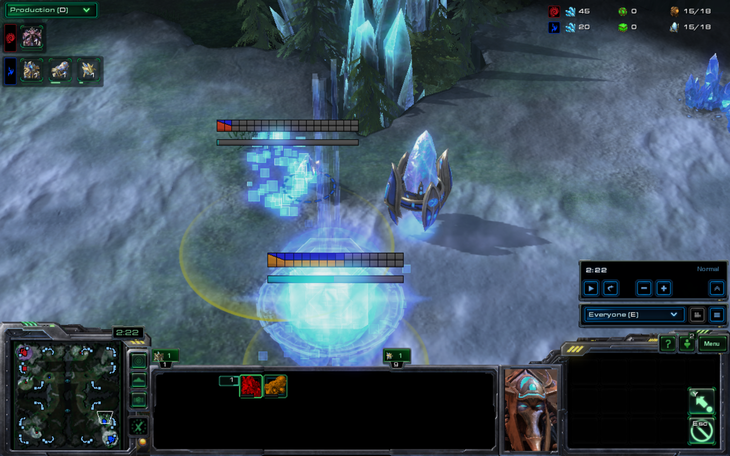 Actually, that attack never got to my base, because he decided to patrol the map and look for stuff. Two evolution chambers for him- I can not believe he is admitting I am ahead in upgrades. 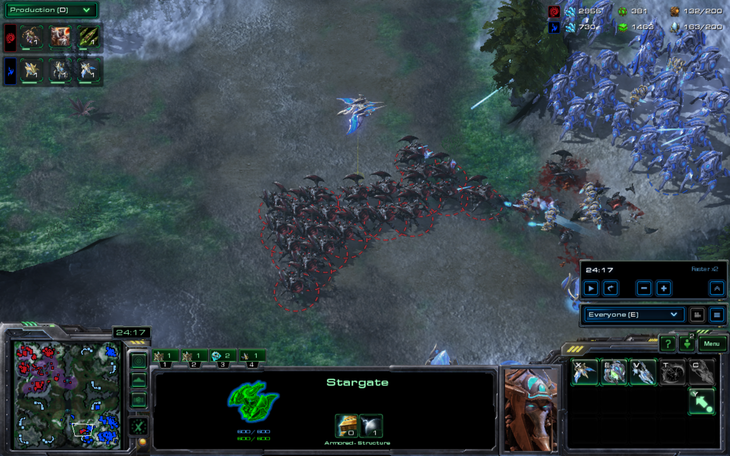 It's like treason to the zerg race if you've played the campaign. 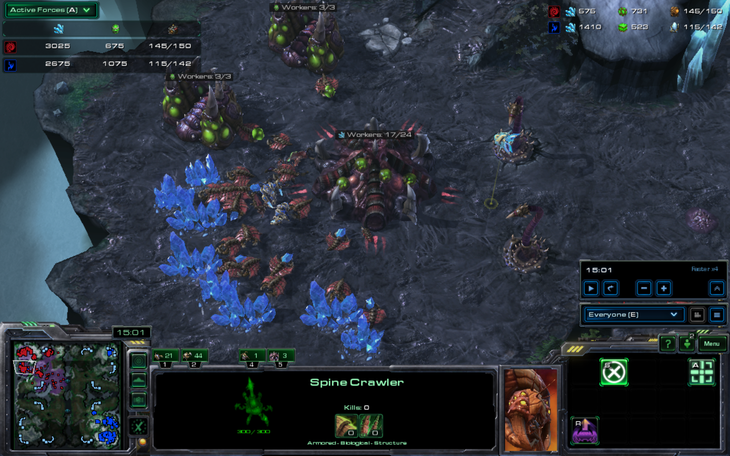 He also decides spreading creep in his main is needed desperately. 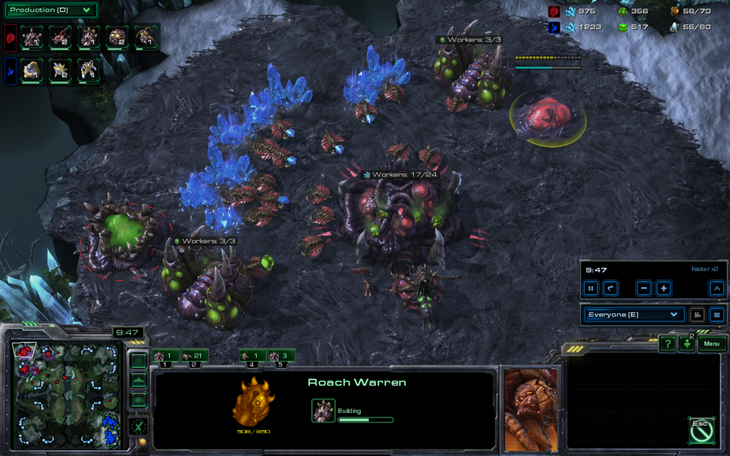 I'm scared of roaches in general, since I've lost lots of games in WoL where they went mass roach against mass immortals and won, so I built a third in the top right. He'll never find me here!! 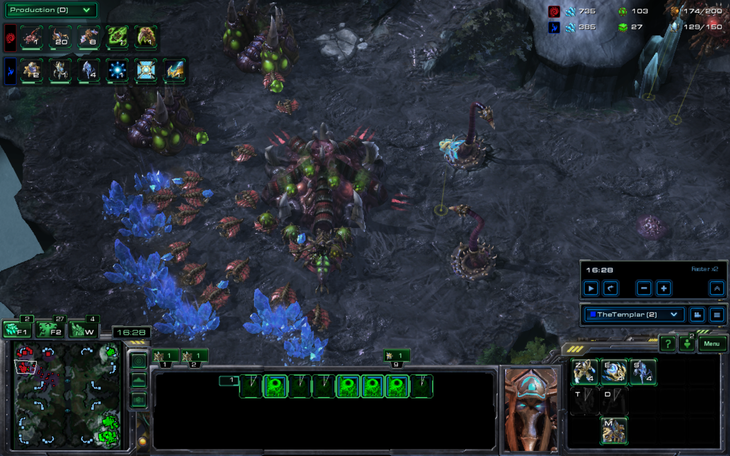 So I build a warp prism and attempt to harass his fourth base. Ok we've harassed this "base" long enough, let's leave. 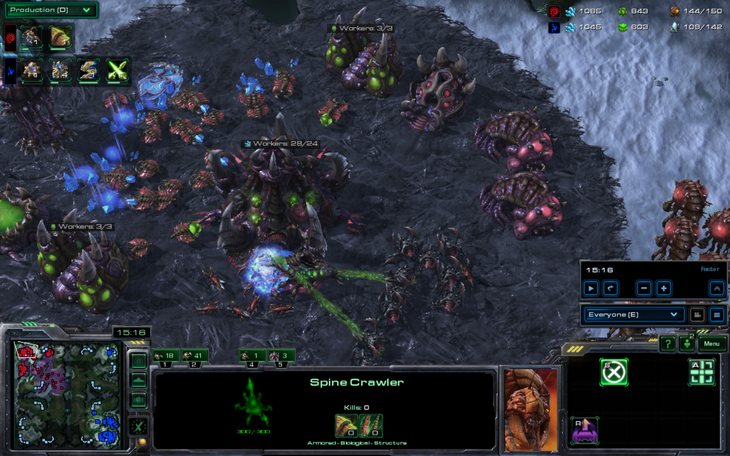 Like every creative zerg, my opponent builds a spire and attacks with a bunch of roaches, expecting, probably, to do some damage to my units and force immortals. 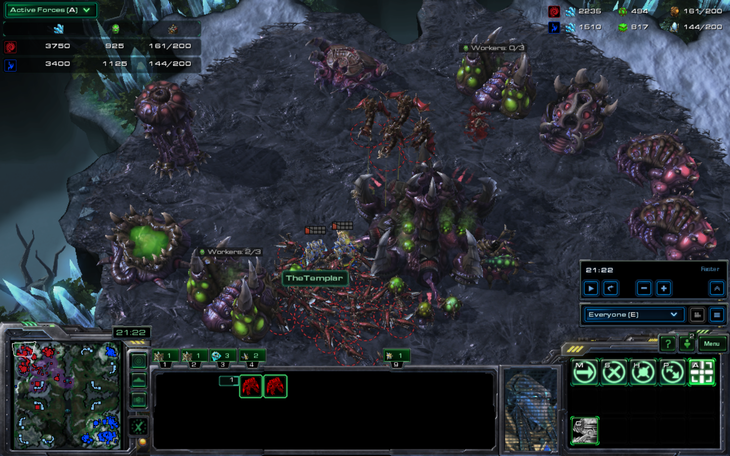 I'm not an idiot- every zerg in silver league does this against me. 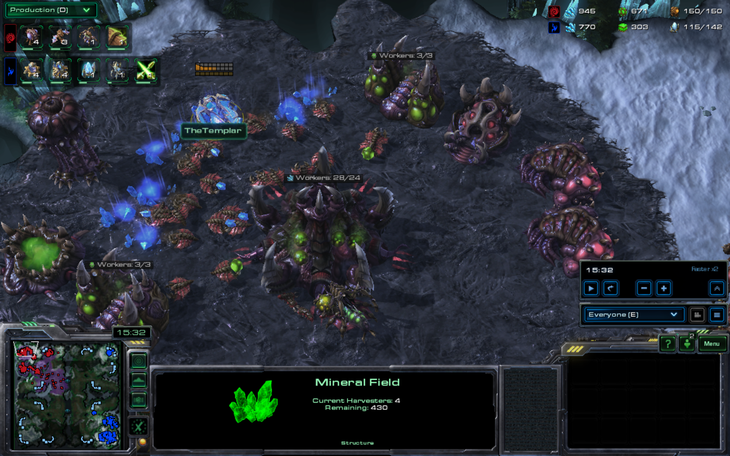 I never bother building immortals, since almost every zerg does mutalisks. However, colossi are good units so I always get them. 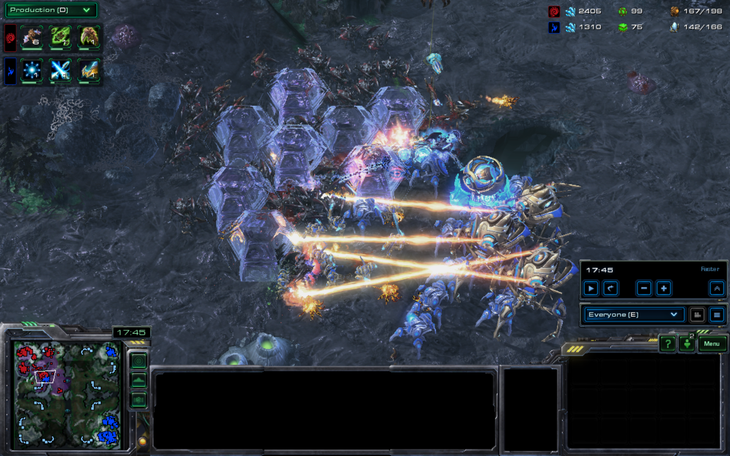 Desperation force fields work out well and my opponent loses a fair number of roaches, forcing a retreat. I saw White-Ra do this once on Red City! Special Tactics! While getting the cranky, flightless probes to start mining at my new expansion, my warp prism decides one of the drones is attractive and starts stalking it. 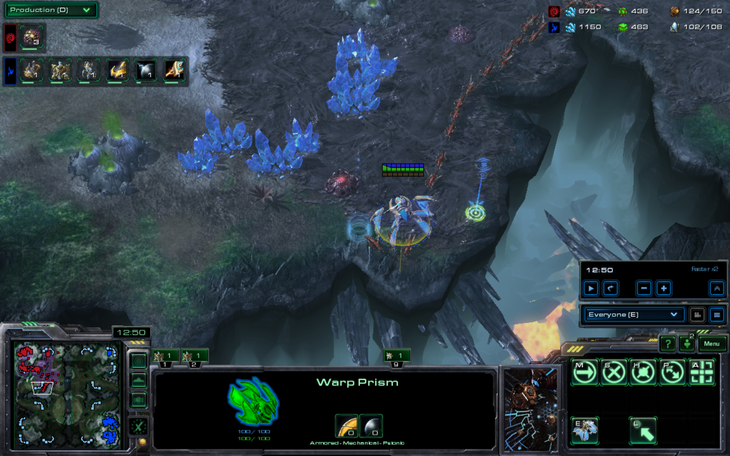 A nearby queen, who happens to love the drone, kills the warp prism out of jealousy. 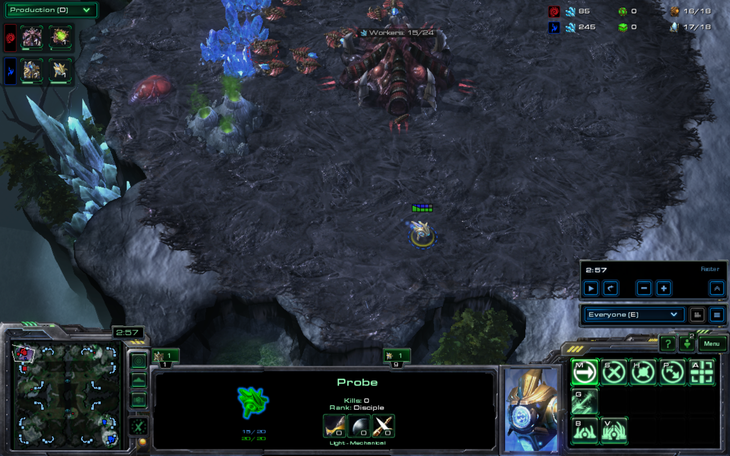 An observer is waiting very patiently at the zerg natural for anything strange, but all it can report is mining. Suddenly, 11 mutalisks (not shown) fly right past it. 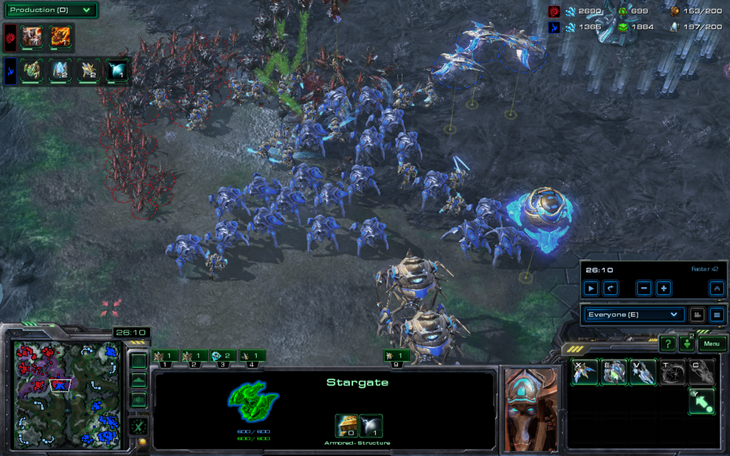 Unfortunately, I was gathering my army in preparation to attack. Mutalisks? Better get warp prism speed. 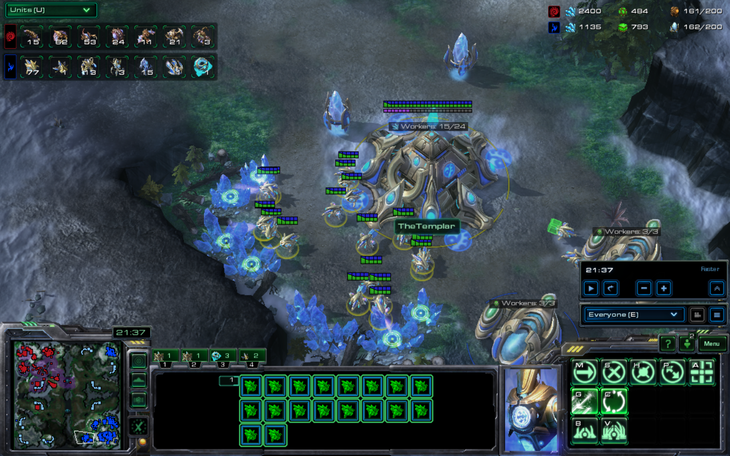 In the below pictures, the epic journey and terrible damage of these eleven mutalisks are displayed for the masses of team liquid to gaze upon in utter horror. I go for the attack! 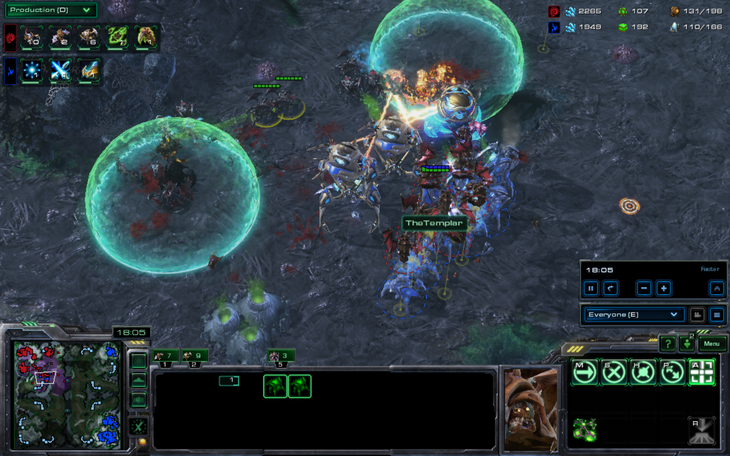 Nice forcefields, but I lost all my zealots before reacting because I was putting probes in empty assimilators. I decide that colossi are good and I make one run away from the mutalisks before it dies. So, he confidently takes two more bases. 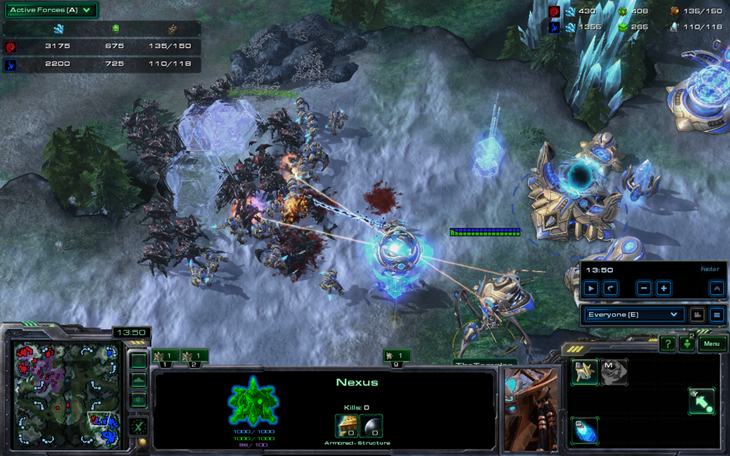 I decide to warp in 6 zealots above his third base next to an overlord. 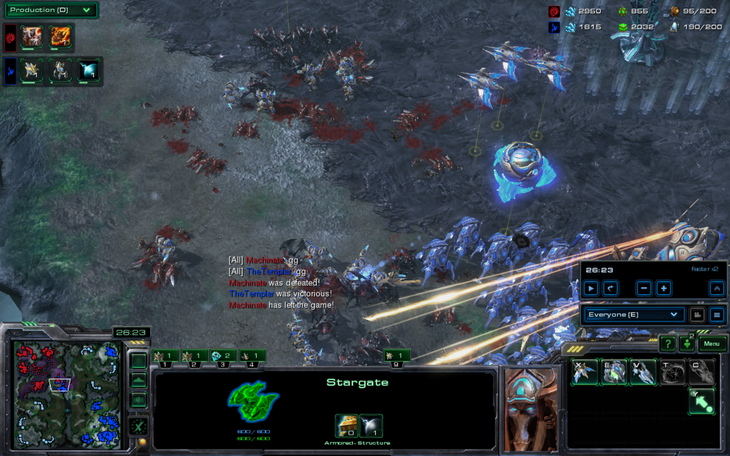 Realizing he could see me, I ferry 4 of the zealots into the third base while making two of them walk. This doesn't work well, so I brilliantly decide to steer two survivors into the main base. "Quick, attack the evolution chamber!" No, wait, that's not right, kill queens! And drones! 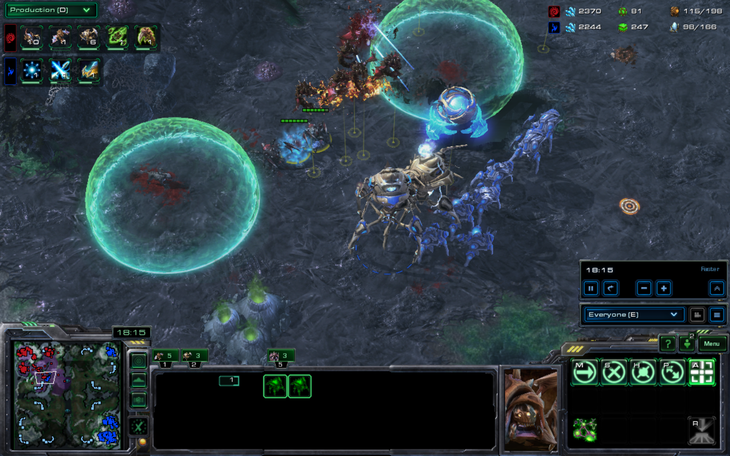 I got five drones in the main using hold position micro and a few zerglings but lost the zealots- a decent trade I guess, since the warp prism survived. Four saturated bases because I love macro! 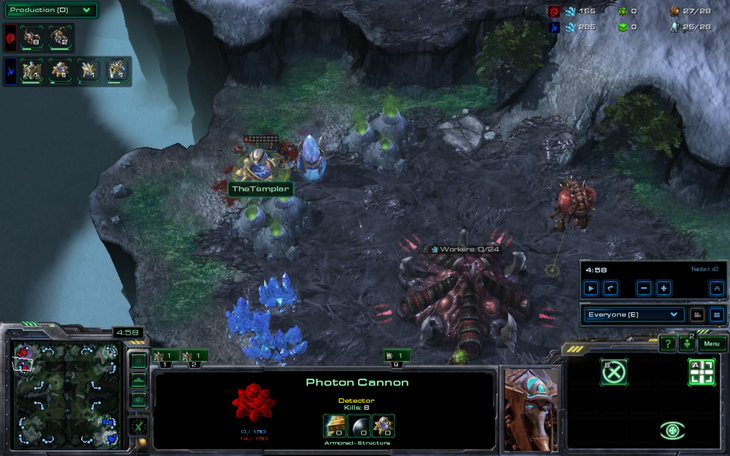 I decide suddenly to use my warp prism to put zealots on the fifth, which I just scouted, while barreling down his front. Unfortunately, since colossi are slow, they were left behind while the rest of my units went somewhere, and they died very fast. 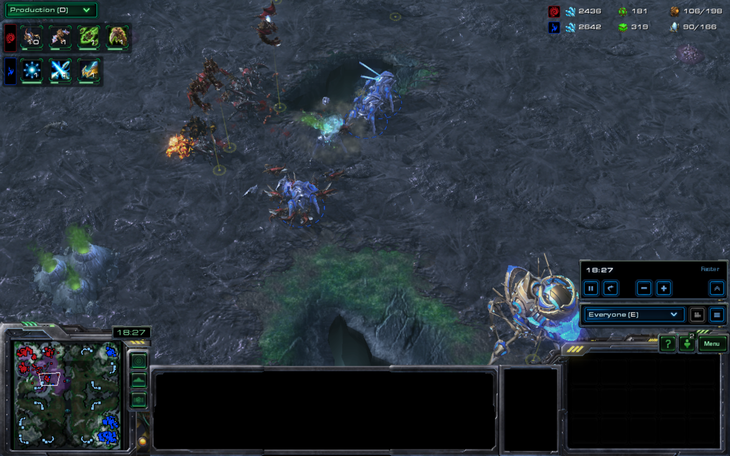 Fortunately, he runs right into my zealots and stalkers, as I turned around as soon as I realized I was losing colossi. Micro starts happening! Yay! 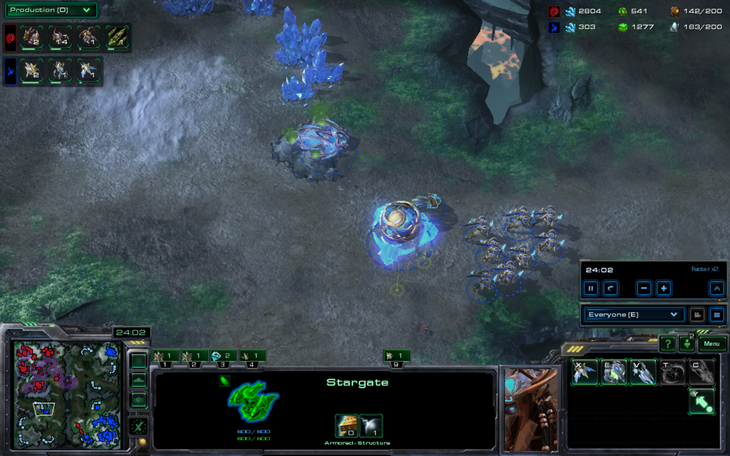 I love microing stalkers. 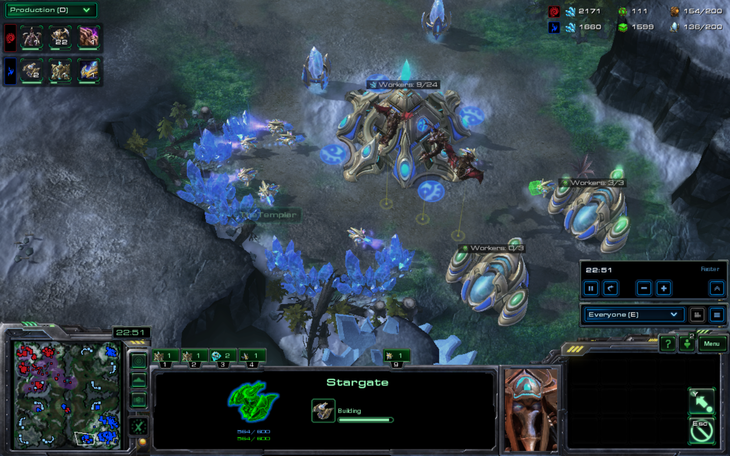 After this excellent engagement, I decide to take another base. Because why not? 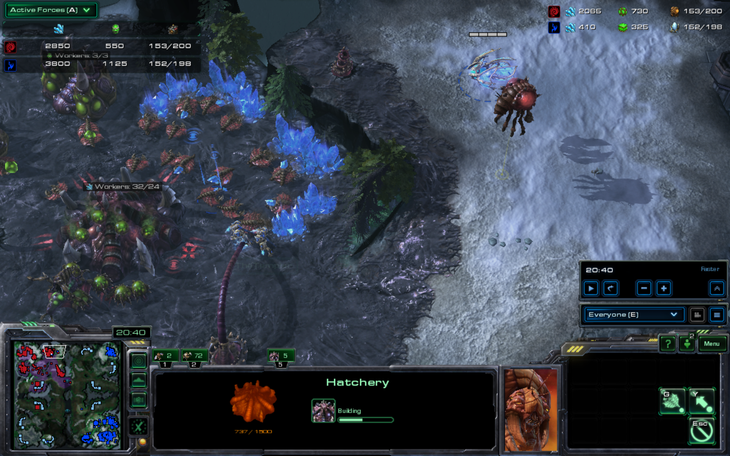 AND phoenixes to deal with those pesky mutalisks. And I'm macroing like a- wait what happened here? 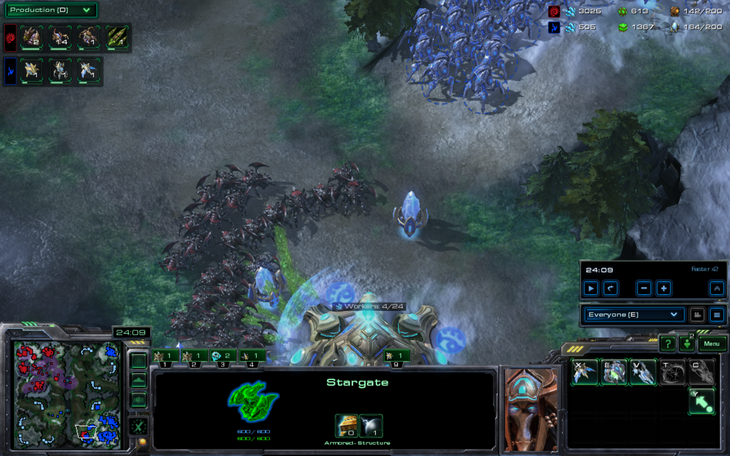 Don't you hate it when you realize there were mutalisks while you microed stalkers? Scroll up a few pictures and you'll see... they came from the south. Oh. Yes, yes I see what has happened here. Suddenly, I realize that I was, in fact, harassing the fifth. It turns out I killed it and we both forgot about it. So I decided units were good and brought them back. 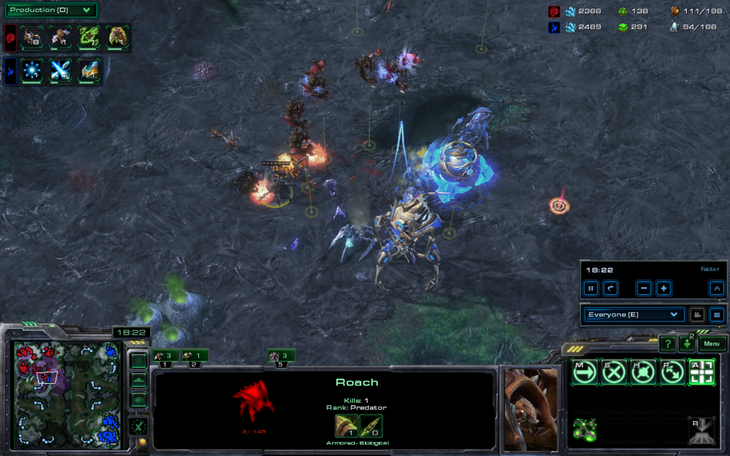 Huge roach attack into the third fourth base! Oh no! 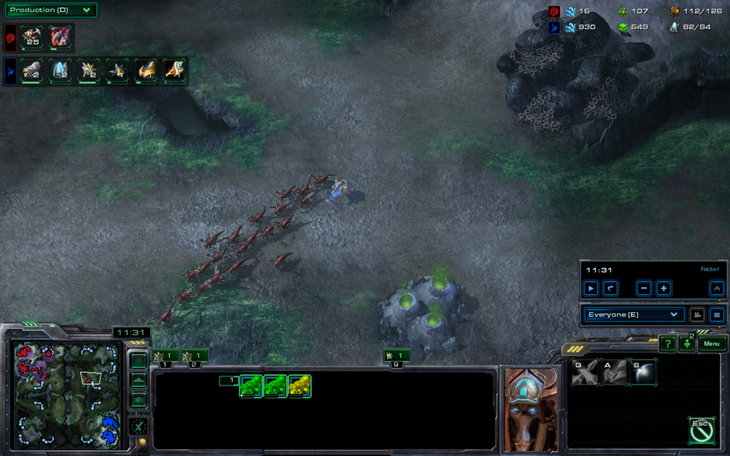 Armies are the counter to roaches. 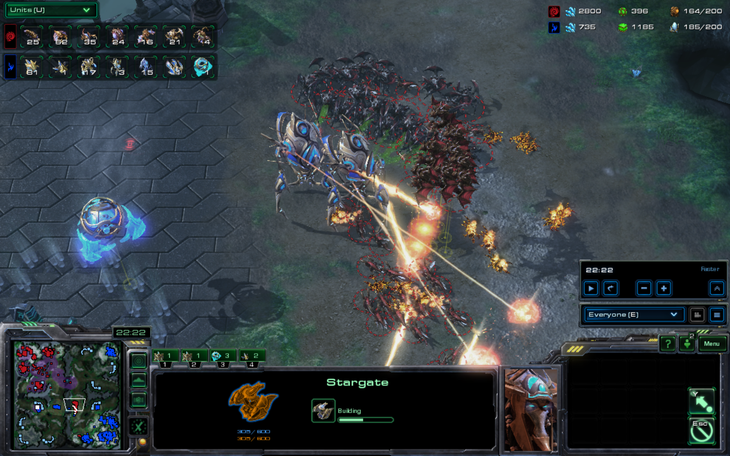 I give chase with everything, including a flank with those units I was bringing back. I back up, he springs forward, and I retaliate. Engagement time! 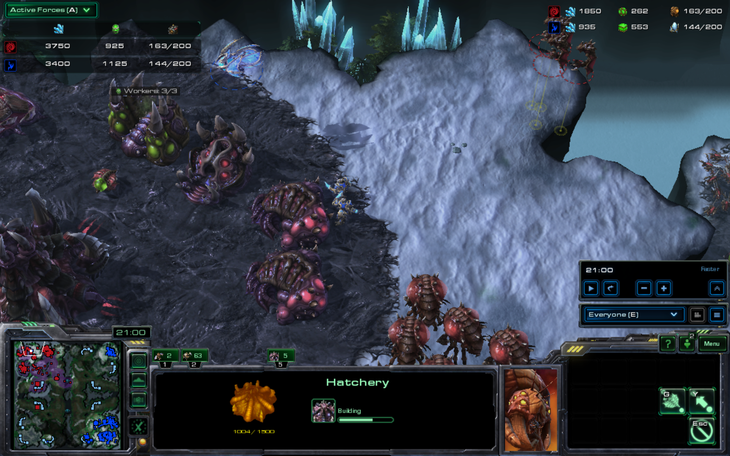 After that exciting engagement, which I win easily (I lost eight supply, he lost about 80! ), he taps out. 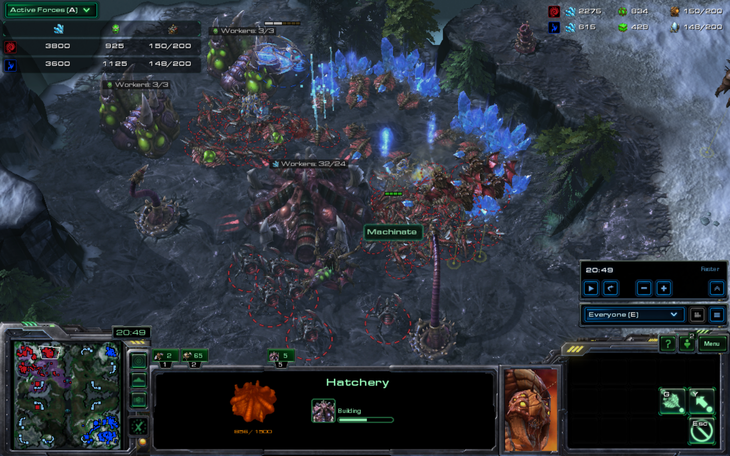 It was a fun game, but the usual macro and multitasking issues I normally have kept plaguing me this game. 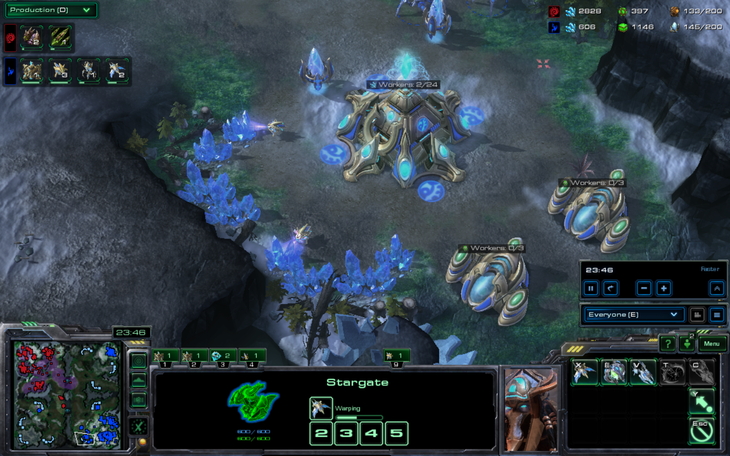 Not only was I supply blocked a lot (about 5 minutes), but my build was awful and I floated hundreds of minerals before really getting into the game. 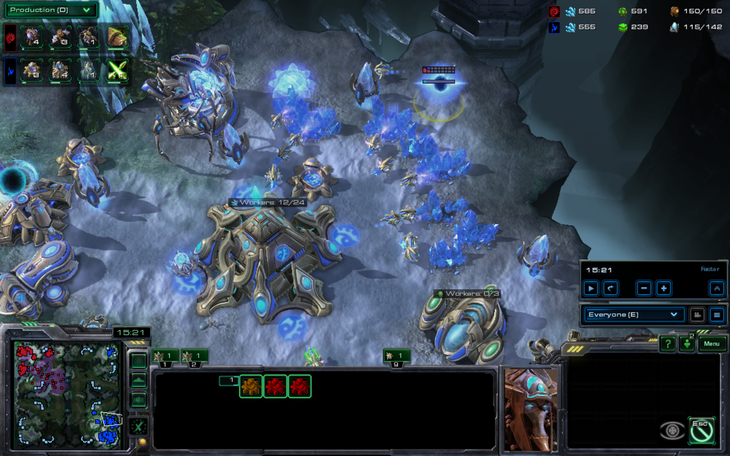 I was also lucky that my opponent did not take a bunch of bases and make hive units because I wasn't very aggressive and stayed on mostly zealot/stalker, though I had better upgrades. 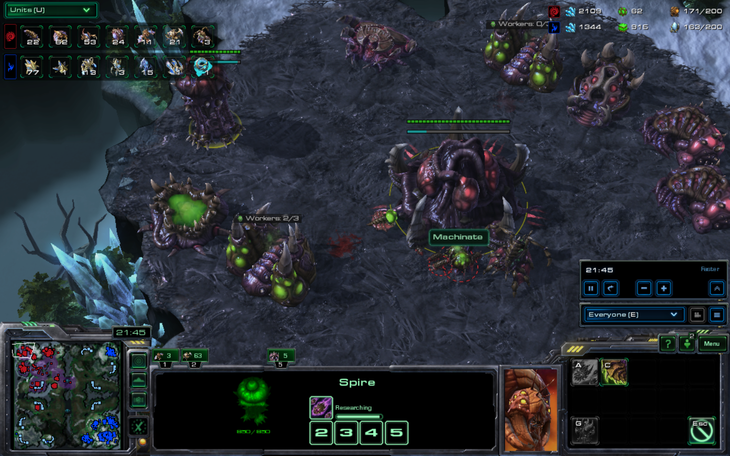 I would not have done so well against a infestor/hive army attacking 5-6 minutes later. 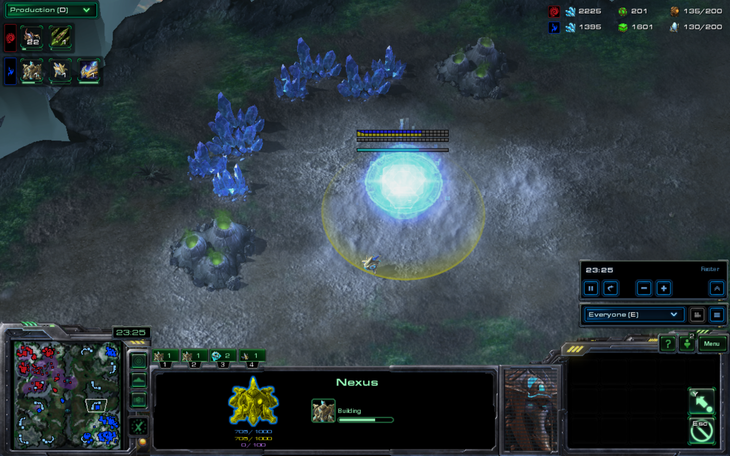 In a nutshell, we were both silver league and therefore made lots of mistakes. GG. If you enjoyed this battle report, please vote for me below- I promise more battle reports if I make it into the RO16 of the TLCMAT. Your vote: The_Templar vs Liquid`Nazgul?